Tea Ceremony Experience En is located close to Chion-in Temple, and it’s called En because in Japanese en means both relationships and round, and they want their tea ceremony experience to become a place where people can get together. The machiya townhouse where the tea ceremony takes place has a very Japanese atmosphere; it has tatami mats, inner garden. Their classes are in simple, easy to understand English, and they tell you a lot about the history and culture of Japan and tea. They also show you how to stir matcha. Lastly, you get to try stirring matcha yourself (the teacher will help you). During this learning process, as you’re in a quiet, secluded, and beautiful place far removed from the busy city life, you get to truly relax. If you want to experience the tea ceremony here, you have to make a reservation on their official website. This is an unforgettable chance to get to know Japanese culture in Kyoto. The teacher will use simple English to tell you about the tea ceremony and the concepts behind it, like “wakei seijaku” which means calmness, quiet, and respect while doing a tea ceremony. First, the teacher will show you the proper way of holding a tea ceremony. Each move is carefully calculated, and amidst the quietness, she will use the tea utensils, which she first purifies, to make you matcha tea. Put one-and-half scoops of matcha into your bowl, and start making a movement resembling the letter W, and soon you will have a bowlful of frothy matcha! After stirring the matcha, you get to drink it. You should drink it in three gulps, and make a slight slurping sound in the last gulp because this way you get most of the matcha “crema” too. 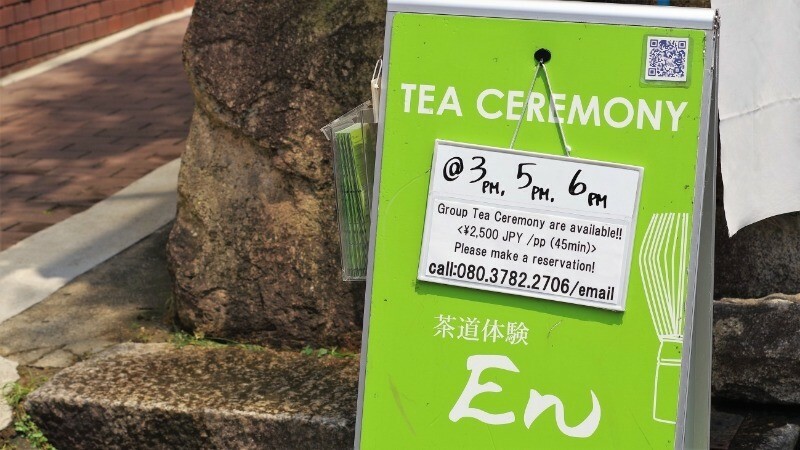 The tea culture of Japan is wide-ranging and profound, and by taking today’s tea ceremony experience at En, I too learned to love the tea ceremony. Each move is thoroughly calculated, calm, and the feeling is almost stately; very calm. If you want to learn about the Japanese tea ceremony, this is a good place to start your studies. At first, I felt a bit nervous, but as the teacher kindly told me about the tea ceremony and the tools used in it, I began to feel at ease. You get to stir macha in a very Japanese room, which has tatami mats, sliding doors, and a “tokonoma” where you can see a beautiful hanging scroll. A one-minute walk from Kyoto City bus stop Chion-in-mae. Group session (45min) : ￥2.500 per person Private session for two or more (45min) : ￥4,500 per person. Private lesson for one person (45min) : ￥9.000. Close to the famous Chion-in Temple, and they have the experience in English, so you get to dive into Japanese culture.